Visit the best American breweries of 2018 while minimizing travel time and distance. RateBeer published their list of top 100 breweries in the world a couple of weeks ago. Of those 100, 71 of them have a physical location that you can visit in the contiguous United States. 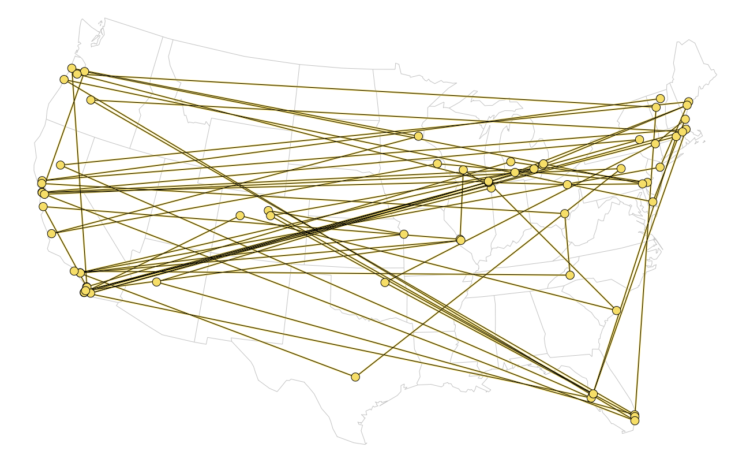 I mapped them to see where they are, but how can we construct the ultimate road trip? Below is the optimized route to visit every brewery in one go. Visit 71 breweries over 197 driving hours and 11,984 miles. Totally worth it. Like with the route I made in 2015, I made use of Randal Olson’s implementation to figure out the routes using a genetic algorithm. The Google Maps API provides the travel times and distances. The algorithm then starts with a random route and then tries to improve with each iteration. Voilà. The ultimate road trip. Using the list below, start at any brewery and visit in order. You’ll end up back where you started. One day. For now, I will just dream.